This morning, President Obama met with Senate Majority Leader McConnell and House Speaker Ryan to discuss legislative priorities for the coming months. One of the five issues they covered was bipartisan criminal justice reform, and when it comes to incarceration rates of Asian Americans and Pacific Islanders (AAPIs), the problem is more widespread than you may think. The AAPI prison population grew 250 percent in the 1990s, and from 2000 to 2010, the number of AAPIs incarcerated quadrupled in size, according to the recent report “Asian Americans & Pacific Islanders Behind Bars: Exposing the School to Prison to Deportation Pipeline.” (National Council of Asian Pacific Americans (NCAPA) members Southeast Asia Resource Action Center (SEARAC) and the Asian Pacific American Labor Alliance (APALA) worked and collaborated with others on the report). Overcriminalization is prevalent in the Southeast Asian American community, a community where many are struggling with legacies of war and trauma. For instance, Vietnamese youth, in addition to Samoan youth, have some of the highest arrest rates in San Francisco County. Complicating matters even more for Asian Americans born outside the United States is the risk of deportation. As a college freshman in the year 2000, Lundy Khoy was a permanent U.S. resident who pled guilty to charges related to Ecstasy. She served three months in jail and was released on good behavior, completing four years of probation. Yet, in 2004, U.S. Immigration and Customs Enforcement attempted to deport her to Cambodia--from which her parents had fled genocide just before she was born--and during this attempt, she was forced to spend an additional nine months in jail--time she would not have served if she had been born in the United States instead of in a refugee camp in Thailand. Today, 12 years later, Khoy still fears being deported from the country she has called home since the age of one. Unfortunately, Southeast Asian Americans such as Khoy are three to four times more likely to be deported on the basis of an old criminal conviction compared to other immigrant communities. Since 1998, 15,000 Southeast Asian Americans have received final orders for deportation, even though many came to the United States with refugee status and obtained a green card. The Senate now has the opportunity to begin reforming the criminal justice system with the bipartisan Sentencing Reform and Corrections Act (S. 2123), which passed out of the Senate Judiciary Committee more than 100 days ago. S. 2123 would take important first steps by reducing federal mandatory minimum sentences and allowing many federal prisoners to earn time credits if they successfully complete prison rehabilitation programs. In addition to supporting this bill, NCAPA would like to see improvements that provide disaggregated data for Asian Americans and Pacific Islanders and that add cultural competency to consideration in evaluations and programming. In the future, we hope that Congress also will address the laws that have created the cloud of potential deportation that follows Khoy and others like her. 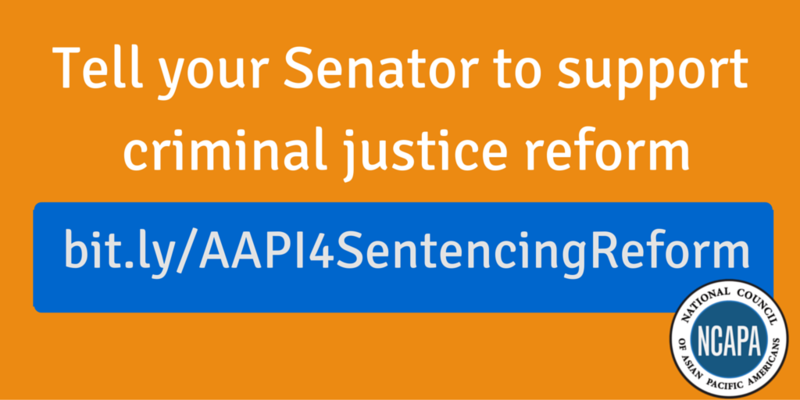 NCAPA has joined the Leadership Conference on Civil and Human Rights to urge Senate Majority Leader McConnell to bring the Sentencing Reform and Corrections Act to a vote, and we have added to the effort with #AAPI4SentencingReform to show our support by demonstrating what’s at stake for our communities. -Check out AAPIs Beyond Bars, a follow up to the AAPIs Behind Bars report that focuses on the principles of seeking mass labor and education, not mass incarceration, and building coalitions with other communities of color.